With an eclectic mix of roots/celtic tunes, classical favourites, and jazz, this family trio presents thoughtful, creative, and well-executed arrangements that engage audiences in concert settings as well as provide pleasing music accompaniment for festive social occasions. 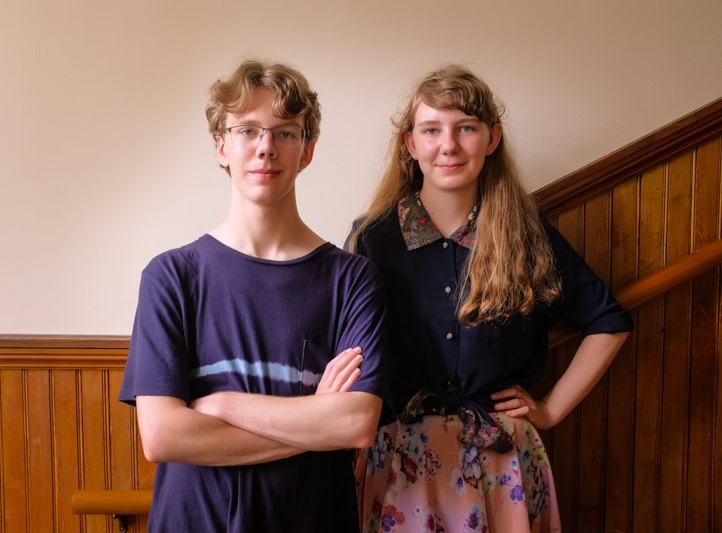 Alistair Maksym (18) is an accomplished young multi-genre pianist with experience in jazz bands, in traditional music groups, in a funk/rock band, and as a choral accompanist, who earned his Royal Conservatory level 10 piano with Natalia Pavlovskaia. His sister, Lydia Maksym (15) is a rising talent on the celtic harp and pedal harp, guided by teachers Ellen Gibing and Alys Howe, who also step dances. Their mother, Jennifer Publicover (MMus. ), is a professional flutist on the Irish flute, the modern orchestral flute, and the Baroque flute who performs in many settings and is on the faculty of the Maritime Conservatory of Performing Arts, Halifax, Nova Scotia. With an eclectic mix of roots/celtic tunes, classical favourites, and jazz, this newly emerging family trio presents thoughtful, creative, and well-executed arrangements that engage audiences in concert settings as well as provide pleasing musical accompaniment for festive social occasions. Alistair Maksym (age 18) is an accomplished young multi-genre pianist with experience not only in classical contexts but also in jazz bands, in traditional music groups, in the funk/rock band The Quadratics, and as a choral accompanist and arranger. He studies at the ARCT level at the Maritime Conservatory of Performing Arts under Natalia Pavlovskaia, and is currently working towards a Bachelor of Engineering degree at Dalhousie University. His sister, Lydia Maksym (age 16) is a rising talent on the celtic harp and pedal harp, guided by teachers Ellen Gibing and Alys Howe, who also step dances. Their mother, Jennifer Publicover (MMus. ), is a professional flutist on the Irish flute, the modern orchestral flute, and the Baroque flute who performs in many settings and genres, including in the neo-traditional band Papilio, and is on the faculty of the Maritime Conservatory of Performing Arts, Halifax, Nova Scotia. Jan. 18, 2019, 7:30pm: Alistair opens as a youth performer for Paula Rockwell and Jennifer King in their concert for the Dartmouth Community Concert Association. Playing Brahms, Rachmaninoff, and his own composition. May 4, 2019: Two private engagements, one for the MCPA Association, the other for Worthington Place. May 11, 2019, 11am-1pm: The Tidewater Trio plays for the Mothers’ Day tea at Evergreen Historic House, Dartmouth. Nov. 28, 2018, 4pm-6pm: The Tidewater Trio plays for the Atlantic School of Theology Open House. Nov. 17, 2018, 2pm-3:30pm: Alistair and Lydia play for the Afternoon Tea in November at Evergreen Historic House, Dartmouth Museum Society. Tickets available at the link above. Oct. 17, 2018: Lydia plays a private engagement for the Halifax Ladies Musical Club. Sept. 17, 2018: Alistair and Lydia play a private engagement for the Canadian Academy of Child and Adolescent Psychiatry Conference. June 29, July 13 and 20, and Aug. 24 and 31, all 1:00pm-4:00pm: The Trio plays for the Friday afternoon Teas at Evergreen Historic House, Dartmouth NS, hosted by the Dartmouth Heritage Museum Society. Book a spot at this link. June 2, 2018, 10:30am-1:30pm: Alderney Landing, Dartmouth NS; and June 3, 2018, 10:30am-1:30pm: NSPower, Building 1H, Lower Water St., Halifax NS. The Trio performs for Doors Open Halifax 2018, a weekend of performances in buildings of historical, contemporary, or architectural significance in the Halifax area.